This series with a new format begins May 7, 2019! This group was created around my observation and teaching thousands of therapists around the world about Tensegrity Medicine. 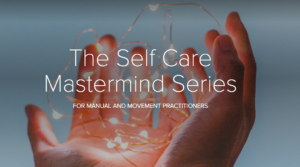 What I came to recognize is that we, as health care providers, cannot ultimately help our clients get to the root cause of their problems until we understand more about our own bodymind connection. What is our awareness of ourselves as whole and complete people? What are our own limitations and belief systems that get in the way of our evolution and living the kind of full life that we want for ourselves? What may be interfering with the progression of our career and business that we really want for ourselves? This online mastermind group is a place for us to come together as a group of therapists who share a passion for helping our clients. We are comfortable with exploring ourselves and the root cause of our clients diagnosis from a place of looking outside the box of traditional mainstream medicine into a more holistic approach to care. This is a place for us to share about ourselves and our own journey. This group is a place where we can learn and be held accountable by others in areas of our own self care, limiting beliefs, and stagnations in our own psyche- All of which may be limiting us from manifesting a more abundant career, home life, and role in our community. Topics will include: Self care practices, habits, resistance, surrender, self love, giving and receiving, dedication, routines, self sabotage, commitment, core beliefs, intimacy, self worth, resiliency, fear to name a few. This course will meet monthly. An initial 6 month commitment required. $50.00 per month subscription basis. 6 month commitment required.